Mera Peak is the highest peak among trekking peaks; It lies in Hinku valley of the Khumbu region. Before attempting a higher mountain it would be worth trying Mera Peak for acclimatization purposes. All the hardships will be forgotten once you are on the summit because from the top of Mera the gigantic view of Everest, Lhotse, Choo yu, Nuptse, Makalu, Kanchenjunga & many more peaks are visible in 360 degrees angle. The view from the Mera Peak summit is one of the finest in the Himalaya with five 8,000m peaks visible: Mount Everest, Lhotse, Cho Oyu, Makalu, and Kangchenjunga, as well as other Himalayan peaks linked below. 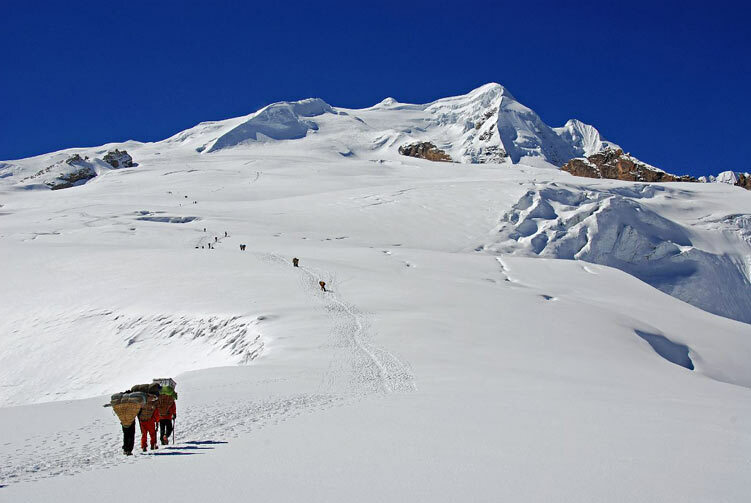 The standard route from the north involves high altitude glacier walking. The ease of reaching this elevation may be its biggest danger but good weather and snow conditions are, of course, necessary for safety and success. The west and south faces of the peak offer more difficult technical routes. Day 20: Mera Peak Climbing with Mingbo La Pass trek ends /Transfer to airport for final departure onward journey. Mera Peak Climbing permits and TIMS Card fees. Mera Peak Climbing group climbing gear, climbing rope, snow bars & carabineers etc.